We have compiled research, highlighted trends, and quantified key growth challenges from over 30 studies and reports from world-class sources and present them to you in this benchmarking section in 3 main categories: Sales Effectiveness, Marketing and Integrating Results. WHAT ARE THE SIGNS OF AN UN-INTEGRATED GO-TO-MARKET APPROACH? Use this gold mine of comparative data to better recognize the symptoms of un-integrated Go-To-Market approach and to set improvement goals. Borrow these stats to initiate discussion and trigger higher efficiency levels within your own organization. Or feel free to contact us to schedule a presentation tailored to your specific areas of interest. Reach us at info@optimizosolutions.com. Sales cycles are increasingly complex and now include many more people in the decision-making process. According to Sirius Decisions, sales cycles are 22% longer now than they were 10 years ago. 62% of the average company’s revenue is brought in by 20% of the total sales force (Accenture). Effective sales coverage strategies are critical for productivity. World-class sales organizations outperform less disciplined companies by more than 22% in key metrics. The most significant metrics are: Number of qualified opportunities, New account acquisitions, Average account billing, YOY existing customer growth, Quota achievement, Forecast accuracy. 50% of B2B sales staff consistently miss their sales quotas according to Marketo. The most prominent inhibitor in missing sales quotas are reps’ inability to clearly communicate and demonstrate value messages. The average sales person spends only 18% of their time in face-to-face selling time (Sirius Decisions). Furthermore, 71% of reps lack the ability to connect the company offering to the client’s business and 65% say that their reps spend too much time on non-selling activities (“Paths to B2B Growth”, 2014). According to Sirius Decisions, 85% of B2B marketers describe themselves as “self taught” professionals and more than 51% of B2B companies do not have a marketing department. Marketing is frequently a small “add-on” to the responsibilities of the Sales V.P. C-level buyers use online search engines early in their decision making process. Today, corporate websites represent 58% of leads generated and by 2015, they will represent 71% of all leads. Marketing has become a shared partner in generating sales (Sirius Decisions). 67% of CEOs now consider marketing and sales alignment as a top priority (according to a Forrester Report). Organizations that effectively integrate sales and marketing outperform those that do not by as much as 24% in average revenue growth, and by 21% in profit growth, as revealed by a Sirius Decisions Study of 500 B2B companies over a period of 3 years. Alignment can help businesses become 67% better at closing deals. The average sales person spends nearly 19% of their time generating leads and researching accounts. This “soft cost”, which is often greater than the entire marketing budget, means that, one way or another, the CEO is funding lead generation (Meclabs). 79% of leads generated by marketing do not get a follow-up from sales. The silo nature of these 2 Front-End departments means CEOs are funding “waste” in an unproductive funnel management process. 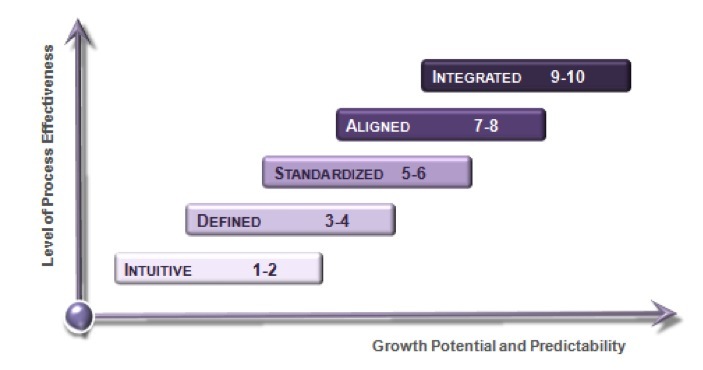 According to another source (Aberdeen Group), companies that have successfully implemented alignment measures achieve an average revenue growth of 32%. 57.1% of CEOs are receptive to leadership coaching and feedback. This is good news for leaders and shareholders because senior executives understand that the ability to embrace productive change that increases long term ROI could be the difference between a good organization and a visionary one. According to a study in the Manchester Review, executive coaching’s ROI is estimated at 5.7 times the initial investment in coaching. According to 2014 Executive Coaching Survey conducted by Stanford University, more than 30% of CEO’s now have a coach. Our diagnostic services use a holistic assessment and scoring approach to evaluate your Front-End functions, which allows companies to benchmark themselves and build organic growth execution plans to move up the scale and achieve double digit growth. Please contact us to find out more about our online Executive Front-End Self Assessment Survey: info@optimizosolutions.com.